Home / Without Label / Wanting change without being willing to change … WTF? Wanting change without being willing to change … WTF? Why is it that two people can be presented with much the same opportunities - one extracts maximum value from those opportunities and makes things happen - the other does not - why? I think there are a few big contributing factors …. and I think that one of them is this: the person who is willing and able to continually re-invent themselves - has a huge advantage over the person who is unable or unwilling to do so. It is difficult, if not impossible, to create a new paradigm while preserving the status quo. New realities are not created by doing the same old thing, or by being the same old person. 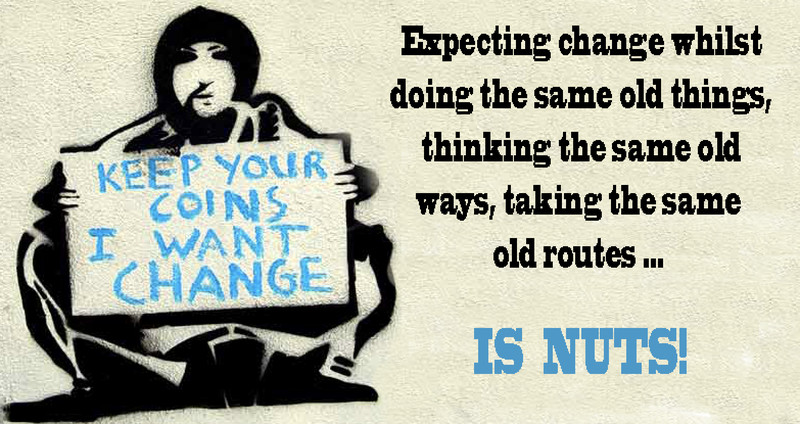 Wanting change without being willing to change is nuts. Habits can be good and bad … but they can also be restrictive, in that they bind us to the status quo. Nature loves genetic variation - for a reason! Genetic variation is what makes us all unique … the less variation, the more alike we all are - the greater the variation, the more differences. I feel that thinking works in much the same way … when our thoughts run along the same pathways and in common and familiar directions, then we cannot expect unusual outcomes.